We're having a party. Please drop by. Toby (and Ellen), let's keep talking about Tolle. I've set up ... no, wait ... you should read about it here. Everybuddy, come on over to Essencia Island. I haven't had much time to read this past week. Most nights I've fallen asleep after a paragraph or two, but I finally finished the book last night. Here a few thoughts on the last sections of the book. Because I stopped reading at page 261 before, I'm starting here with the last two questions of set two. 29. Ostensibly, Hanna is the one we are reading about here: "I wanted to give a sense of the people of the book, the different hands that had made it, used it, protected it" (p. pp. 264-265). 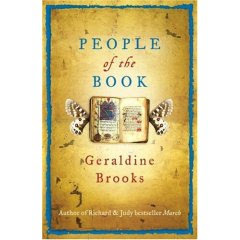 Since this sentence provides us with a good explanation for the book's title, how well do you think Geraldine Brooks has done in giving us a sense of these people? "Well, from what you've told me, the book has survived the same human disaster over and over again. Think about it. You've got a society where people tolerate difference, like Spain in the Convivencia, and everything's humming along: creative, prosperous. Then somehow this fear, this hate, this need to demonize 'the other' - it just sort of rears up and smashes the whole society. Inquisition, Nazis, extremist Serb nationalists ... same old, same old. It seems to me the book, at this point, bears witness to all that" (p. 195). 30. Were you expecting the death of Alia (p. 270)? Or had you hoped for a happy ending, in spite of Ozren's words to Hanna, "Not every story has a happy ending" (p. 37)? To be honest, I hadn't thought too much about Alia since Hanna left Sarajevo. But his death felt like it fit with what else was happening - and it was absolutely necessary to give motive for Ozren's later actions. 33. "Too finely dressed to be a servant, and fully participating in the Jewish rite, the identity of that African woman in saffron has perplexed the book's scholars for a century" (p. 20). When I read that, I made a note: "Okay, I'm hooked; I want to know who this woman is." Now we know (p. 315). Who is she, and why is she in the picture? I love that Zahra put herself into this picture. To me it's part of the witness of the Sarajevo Haggadah - as well as the message of People of the Book: the importance and value in accepting and celebrating our common humanity. 35. What a way to reconnect with Lola, having her discover something hidden in the museum in Israel. Was this discovery a miracle? Or was it beyond believable to you? Almost unbelievable, I think, but I'm pretty much able to accept these kinds of coincidences in the novels I read - and it did bring us full circle to Lola's girlhood with Serif Kamal and his efforts to save the book. 36. "What skills could you possibly have, darling?" (pp. 343). Could you imagine Hanna's mother saying such a thing, even though she's trying to keep Hanna off the board of the Sharansky Foundation? Hanna responded in exasperation, "How is it ... that a man like Aaron Sharansky could have loved someone like you?" (p. 344). Is their mother-daughter relationship believable? What did you think about Hanna's decision to "change my name to Sharansky" (p. 345). Do you think they can ever heal the rift? The turmoil in the relationship between Hanna and her mother is believable to me, and it has such deep roots that I don't know if they'll ever be able to heal the rift. It's a sad situation, because they could be each other's greatest supporters. 37. How would you feel if you'd changed your whole professional life six years ago, and now discovered you had been right all along? Vindicated, I guess, but extremely frustrated. All the self-doubt that Hanna had for those six years! But she was able to do some other great things that she probably wouldn't have done - so it wasn't really wasted time. I was thinking I'd post up a short summary of each of the Jane Austin books we are considering as a possible choice for reading. Taken from the poverty of her parents' home, Fanny Price is brought up with her rich cousins at Mansfield Park, acutely aware of her humble rank and with her cousin Edmund as her sole ally. When the Crawfords arrive in the neighbourhood, they bring the glamour of London life with them. Mansfield Park encompasses not only Jane Austen’s great comedic gifts and her genius as a historian of the human animal, but her personal credo as well—her faith in a social order that combats chaos through civil grace, decency, and wit. At the novel’s center is Fanny Price, the classic “poor cousin,” brought as a child to Mansfield Park by the rich Sir Thomas Bertram and his wife as an act of charity. Over time, Fanny comes to demonstrate forcibly those virtues Austen most admired: modesty, firm principles, and a loving heart. As Fanny watches her cousins Maria and Julia cast aside their scruples in dangerous flirtations (and worse), and as she herself resolutely resists the advantages of marriage to the fascinating but morally unsteady Henry Crawford, her seeming austerity grows in appeal and makes clear to us why she was Austen’s own favorite among her heroines. The book is 241 pages. During her first season at Bath, a young girl experiences the joys of fashionable society. When her sophisticated new aquaintances invite her to their father's mysterious house, she fabricates her own Gothic romance, imagining the crimes that have been committed there. Northanger Abbey is both a perfectly aimed literary parody and a withering satire of the commercial aspects of marriage among the English gentry at the turn of the nineteenth century. But most of all, it is the story of the initiation into life of its naïve but sweetly appealing heroine, Catherine Morland, a willing victim of the contemporary craze for Gothic literature who is determined to see herself as the heroine of a dark and thrilling romance. When Catherine is invited to Northanger Abbey, the grand though forbidding ancestral seat of her suitor, Henry Tilney, she finds herself embroiled in a real drama of misapprehension, mistreatment, and mortification, until common sense and humor—and a crucial clarification of Catherine’s financial status—puts all to right. Written in 1798 but not published until after Austen’s death in 1817, Northanger Abbey is characteristically clearheaded and strong, and infinitely subtle in its comedy. The book is 488 pages. Anne falls in love with Wentworth, who had nothing but himself to recommend him, and no hopes of attaining influence, so persuaded by friends and family she breaks off the match and sends him away. Years later, he returns, is it too late? Of all Jane Austen’s great and delightful novels, Persuasion is widely regarded as the most moving. It is the story of a second chance. Anne Elliot, daughter of the snobbish Sir Walter Elliot, is woman of quiet charm and deep feelings. When she was nineteen she fell in love with—and was engaged to—a naval officer, the fearless and headstrong Captain Wentworth. But the young man had no fortune, and Anne allowed herself to be persuaded to give him up. Now, eight years later, Wentworth has returned to the neighborhood, a rich man and still unwed. Anne’s never-diminished love is muffled by her pride, and he seems cold and unforgiving. What happens as the two are thrown together in the social world of Bath—and as an eager new suitor appears for Anne—is touchingly and wittily told in a masterpiece that is also one of the most entrancing novels in the English language. The book is 206 pages. Come on over to the island, Essencia Island, that is! The party food is out, and I'm sure we'll get a chance to visit with Hanna and Ozren. Raz should be there, too, along with anybody else in the book you'd like to invite. Now, could I get you something to drink? Neco: Did someone mention that there was a way to edit comments before? Going to go check the help posts. Bonnie: No, sorry, no way to edit posts ... EXCEPT by deleting the one you didn't like (you as commenter can do that) and starting over to do a corrected comment. Best to do it the other way around ... FIRST write the corrected comment, check it against the other one, and "publish" it as a comment ... THEN go back and delete the inaccurate one. It's time to suggest more books. Neco says, "I just read Ella Minnow Pea with another book club and thought it made a good book club book and it's fairly short. I've also been interested in reading one of the lesser known Jane Austins since I've been watching all the movies on PBS. Persuasion, Northanger Abbey, or Mansfield Park." Bonnie says, "I watched The Jane Austen Book Club video with a couple of book club friends, and I think that novel would be a good choice. Another possibility is Sara Gruen's Water for Elephants, which lots of book clubs are reading. Here are links to the books, some of which have excerpts you can read." Shirley has added Little Heathens: Hard Times and High Spirits on an Iowa Farm During the Great Depression by Mildred Armstrong Kalish. I have good news for you, Shirley: the paperback version is to be published on April 29, 2008. Maybe we should consider this one for May or June? Sounds perfect to me! Bonnie has added Windfalls, a novel by Jean Hegland, who wrote Into the Forest, another great novel. NOTE: I'm taking Water for Elephants by Sara Gruen off the list. I had forgotten we already considered this one last fall. Alison and Neco have spoken: Don't take away suggestions just because they have been considered before. Okay, I'll put it back in the mix. Thanks for speaking up. Actually, I know at least one other person will take part in our discussion. Masha Hamilton, the author, has already agreed to answer our questions. When Fiona Sweeney tells her family she wants to do something that matters, they do not expect her to go to Africa to help start a traveling library. But that is where Fiona chooses to make her mark: in the arid bush of northeastern Kenya, among tiny, far-flung communities, nearly unknown and lacking roads and schools, where people live daily with drought, hunger, and disease. In The Camel Bookmobile, Fi travels to settlements where people have never held a book in their hands. Her goal is to help bring Dr. Seuss, Homer, Tom Sawyer, and Hemingway to a largely illiterate and semi-nomadic populace. However, because the donated books are limited in number and the settlements are many, the library initiates a tough fine: if anyone fails to return a book, the bookmobile will stop coming. Though her motives are good, Fi doesn't understand the people she seeks to help. Encumbered by her Western values, she finds herself in the midst of several struggles within the community of Mididima. There the bookmobile's presence sparks a feud between those who favor modernization and those who fear the loss of the traditional way of life in the African bush. The feud heightens when one young man—"Scar Boy"—doesn't return his books. As promised, the library stops all visits, but Fi goes to the settlement alone, determined to recover what has been lost. Evocative, seamless, and haunting, The Camel Bookmobile is a powerful saga that challenges our fears of the unknown. It is a story that captures the riddles and calamities that often occur when two cultures collide. It follows an American librarian who travels to Africa to give meaning to her life,and ultimately loses a piece of her heart. In the end, this compelling novel shows how one life can change many, in spite of dangerous and seemingly immutable obstacles. 25. Will all humans someday be blended, like Raz (p. 141)? Is this the direction humanity is going? As the mother of three bi-racial children, I am in favor of "blending." I think that some of the prejudices and divisions in our society can be overcome this way, as we come to better recognize our common humanity as well as continue to celebrate our diversity. 26. Delilah Sharansky, the Jewish woman introduced on page 202, died in the accident that hospitalized Hanna's mother. Why do you think Sarah Heath never told Hanna about Delilah or her son, the artist Aaron Sharansky? Hanna is very hurt by this lack of knowledge: "It was going to take me more than one night to catch up with thirty years of missing information. Missing love. ... in the end, she'd made all the decisions, and I'd paid for them" (p. 213). And again, "Why hadn't she told me?" (p. 261). While Hanna's mother isn't a particularly sympathetic character, I would like to think that she thought that she was doing the right thing by keeping this secret - perhaps believing that Hanna was better off not knowing about this part of her family so she wouldn't be hurt by the possibility of losing them (like Hanna's mother had lost Aaron). 27. What did you think of the story of Ruti, daughter of David Ben Shoushan and his wife Miriam? Ruti was enthralled by the text, the words, the meaning of the words. Ruti understood the text, "They will build me a temple and I will dwell in them," to mean, "In them, not in it. [God] would dwell within her. She would be the house of God. The house of transcendence" (p. 234). Ruti's story reminded me a bit of Yentl. I was almost going to say that I've liked Ruti's story the best of the background stories so far - but then I had to change my mind because I really liked Lola's too. They are both such strong young women. 31. Where did the white hair come from (pp. 285-286)? And how were cat hairs used in the book? 32. An iconoclast is a person who destroys a culture's religious symbols. What had the iconoclasts done in this section of the book (p. 287)? 33. "Too finely dressed to be a servant, and fully participating in the Jewish rite, the identity of that African woman in saffron has perplexed the book's scholars for a century" (p. 20) ... when I read that, I made a note: "Okay, I'm hooked; I want to know who this woman is." Now we know (p. 315). Who is she, and why is she in the picture? 34. When Hanna returns to Sarajevo for the grand opening of the exhibit of the Hagaddah, she immediately thinks something's wrong with the book in the display (p. 321). How could she make such a major mistake, as her teacher and Ozren both try to tell her? Ostensibly, Hanna is the one we are reading about here: "I wanted to give a sense of the people of the book, the different hands that had made it, used it, protected it" (p. pp. 264-265). Since this sentence provides us with a good explanation for the book's title, how well do you think Geraldine Brooks has done in giving us a sense of these people? It gave me a smile when I read this sentence and thought of how it fit with the title. I think that the book does indeed give the reader a good feel for the people who had been involved with the book. However, I am wondering from whose perspective are these people? Is the author giving us the reader the view of who the people "really" were? Or are the people the ones that Hanna imagines as she researches the lives of the book? Joining in a bit late. . . I just finished this yesterday after a few days of reading--it was hard for me to put down. I very much enjoyed the structure of it, and am just amazed at her vast knowledge of many cultures. There had to have been at least 50 totally new words to add to my vocabulary! (Actually, I probably won't ever remember most of them. Will I ever need to know any of those words that were in italics?) I have read through the discussion questions so far and appreciated the thoughtful answers. This book has definitely stirred up some interesting ideas to think about--I love that! I will hopefully have a chance to at least answer the last set of questions. Delilah Sharansky, the Jewish woman introduced on page 202, died in the accident that hospitalized Hanna's mother. Why do you think Sarah Heath never told Hanna about Delilah or her son, the artist Aaron Sharansky? Hanna is very hurt by this lack of knowledge: "It was going to take me more than one night to catch up with thirty years of missing information. Missing love. ... in the end, she'd made all the decisions, and I'd paid for them" (p. 213). And again, "Why hadn't she told me?" (p. 261). I am puzzled too by Sarah not telling Hanna about her father. If he had some type of shady past or if Sarah was the result of parentage by a man with whom Sarah had had no releationship, perhaps waiting until Hanna was an adult would make sense. Hanna was now an adult though and the relationsip between Sarah and Aaron was a positive one. Marg's comment about Hanna being a difficult teen makes one realize that she may have been difficult to talk to, but it doesn't sound like Sarah made much effort throughout the years to talk to Hanna. In the past, people used to try to hid the fact that a child was adopted from their child thinking that was the best thing. I had thought that this attitude had changed and that people tried to be more open with their children. Sarah seemed so busy fulfilling her own professional interests that she didn't appear to give consideration to Hanna's emotional needs. It is surprising that Hanna grew up as well as she did given the lack of nurturing she received. Someone sent me an email indicating your group is considering selecting The Camel Bookmobile as a reading choice. Just want you to know that if you select the book -- now or later -- I'm happy to participate by answering questions, etc., if you'd like. Sorry I have been a bit AWOL - I had to return the book to the library so I had to finish it off quickly, and then have been not exactly busy, but just not posting all that much anywhere! 24. Marg said, "I was surprised by how quickly Hanna and Ozren fell into bed with each other." Zorro said, "She jumps in bed with Ozren on the day of their first meeting." What do you think of Hanna's reasoning, here? In the context of what had happened just before Hanna said that, I thought it was a justified response. I wonder too if it is meant to give us some idea of the growth that Hanna as a person has had since the beginning of the book, perhaps because of the relationship with Ozren. Given that Hanna already had a history with Raz, one has to respect that she has boundaries that she is not willing to cross. I actually think the fact that Hanna jumped into bed with Ozren so quickly, and this passage are very different circumstances. I commented in the Benetton ad post, I am the mother of a blended child, and therefore it would certainly make his life easier if it was common place and not something completely unusual. Speaking from an Australian perspective, for a very long time, we had a very white society, unlike in America where there are lot of African-Americans. Up until the 1950s or 1960s the official government immigration policy was called the White Australia policy. We welcomed immigrants, basically from anywhere in Europe, as long as they were white. Over the years since then the face of immigration has changed, and seems to change quite regularly now. That doesn't mean to say that there weren't other cultures here but just not in any great numbers. 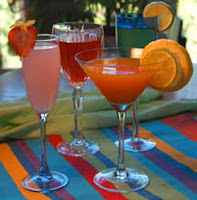 I do wonder if the thought of being blended is really all that new - just that the scope has changed a little. Nowadays it is certainly not unusual for people of one country to move to another country for work or political reasons, and so it is more likely that there will be more mixed relationships. Australian society has changed significantly over the last say 50 years in terms of its multicultural makeup. This may be different from the US where there has been large numbers of different cultures for a long time. Speaking personally, I spent five years living in the UK, basically just because I could. It was there that I met my ex, who was half African and half Carribean, and his parents had met in London in the sixties. I live in a cul-de-sac where there are 6 houses - of those 6 houses as far as I can tell 3 of them house families from a typical Australian/Anglo-Saxon background, one houses an African family who come originally from Ethiopia, one English immigrants, and the other has a Vietnamese family in it. To be honest, I don't think that Hanna's mothers reasons for not telling anything of her background really added up at all. The story of her affair with Hanna's father was moving and tragic, but she seems to have forgotten what it was to love. Having said that, I don't think it was all one sided. It was very clear that Hanna was also somewhat difficult as a teenager. In the end, it would appear that their relationship was one that was quite toxic and could not be made healthier. I found Ruti to be kind of a contradictory character. On one hand she was very devout at studying the scriptures and learning, and on the other she was involved with the book binder. Then, she was very devoted to her brother taking her risks, and in due course putting him at risk also. Her actions in relation to the baby displayed many of her best qualities, but then again, some of her not so great qualities in allowing the mother to believe that the baby was dead. 28. Look up Tomas de Torquemada, if you don't know much about the Grand Inquisitor. The chapter of Fyodor Dostoevsky's The Brothers Karamazov entitled "The Grand Inquisitor" is so important that it has been published as a small book, separate from the huge novel itself. I actually haven't heard of this person before, but just generally the whole idea of the Inquisition is just scary, scary, scary. I do find it interesting that in his bio that there is suggestion that his grandmother was a Jewish woman who had converted to Christianity. Shades of Hitler there in that he had a Jewish heritage and yet they both persecuted the Jews. Having now finished the book, I don't know that we did get a great idea of the people of the book, simply because we were with them for basically one episode in the book's past, and we therefore did not really get to know them to the same depth as we would have had the novel only been about one of these incidents. As a story about the book though, it did work for me. Taking a beautiful piece of literature and following a trail through the various physical changes that had happened to it was very interesting to me. I am generally all for the happy ending, but whilst I would have liked it in this case, I think that it was clear from the description of the injuries and the conditions that would have been prevalent in Sarajevo at the time, there was not ever much hope. Thank you, Shirley, for reminding us that we need to choose our next title. We need suggestions, so I invite everybuddy to give me at least one title of a book you would be willing to read. I'll begin, and I hope Shirley is right there with another title. And you, too, Alison! You were commenting on Shirley's post while I was writing this one. Life as We Knew It by Susan Beth Pfeffer (2006) is about an asteroid hitting the moon, has 337 pages, and is available only in hardback ... but it's an inexpensive hardback because it's a book for teens. Pocketful of Names by Joe Coomer (2005) is set on an island off the coast of Maine (USA), has 417 pages, and is available in paperback. 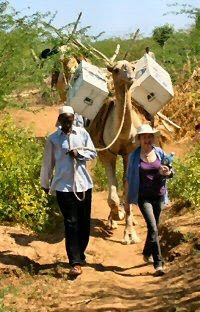 The Camel Bookmobile by Masha Hamilton (2007) is set in Kenya, has 336 pages, and comes out in paperback on April 1. Purple Hibiscus by Chimamanda Ngozi Adichie (2003) is set in Nigeria, has 307 pages, and is available in paperback. What will our next book be? This month's selection (especially with all of the next links and insights) has been thoroughly enjoyed, but I want to see if our library has the next selection avaailable or if I need to order it. I hope we can get some of our other members to be able to join in next month. 25. Will all humans someday be blended? Is this the direction humanity is going? Raz was one of those vanguard human beings of indeterminate ethnicity, the magnificent mutts that I hope we are all destined to become given another millennium of intermixing. His skin was a rich pecan color from his dad, who was part African American and part native Hawaiian. His hair, straight and glossy black, and the almond shape of his eyes came from his Japanese grandmother. But their color was the cool blue he'd inherited from his mum, a Swedish windsurfing champion. ... Raz's wife was the daughter of an Iranian-Kurdish mother and a Pakistani-American father. 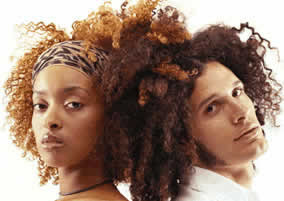 I couldn't wait to see their kids: they'd be walking Benetton ads (p. 141). Obama’s family ... [is] ... unusual in the extent of its continent-crossing, religion-melding, color-fusing richness. But the Benetton-ad family is less unusual than it may seem. This is the age of globalized, far-flung families. I think our problem with remembering who's who in this book is the extremely extensive number of characters! I was ready to throw the book across the room earlier today ... out of frustration ... as I tried to keep names straight in the section about the slave from Ifriqiya (is that Africa? ... I need to look it up) on pages 273-316 about "A White Hair" in Seville, 1480. Not only do the characters have names, but they also have their original names ("the girl he calls Nura" on one page says, "Isabella ... is my Christian name" on another page) and names that keep changing ... because of some whim of their owners or because the "name" is simply a designation, like al-Mora ("the Moorish woman" ... I'll call her the artist for simplicity; and we learn that Kebira's name had once been Muna ... who later calls the artist "Muna al-Emira, the emira's desire"). Got that? No? It's confusing enough that we have bits of the different languages along with the different religions (Allahu akbar is a Muslim prayer saying ... I think ... "Allah is one" or the one God). Reading this book is a lot of work! It's enough to make me long for a simple book where the protagonist has a single name and the plot moves forward with no flashbacks! Okay, I looked up IFRIQIYA in Wikipedia: "In medieval history, Ifriqiya or Ifriqiyah (Arabic: إفريقية) was the area comprising the coastal regions of what are today western Libya, Tunisia, and eastern Algeria. This area included what had been the Roman province of Africa." Because I carefully wrote down the word (I F R I Q I Y A), I then promptly noticed a typo in this section where the word is spelled with an N: Infriqiya. Do I win a prize? I also looked up the Arabic phrase in Wikipedia and discovered I had it wrong: Allāhu Akbar, الله أكبر, is usually translated "God is great" or "God is [the] greatest." It is a common Arabic expression, used as both an informal expression of faith and as a formal declaration. I'm taking a break from reading, mid-section. Maybe I'll go out for lunch and a trip to the library. Maybe I'll come back to the book with fresh eyes. Maybe it will be easier then. Oh, the photo? 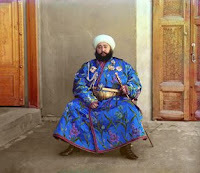 He's the Emir of Bukhara, who had his picture taken in 1911. Click to enlarge the photo and study the elaborate embroidery on his tunic. Or coat. Or whatever the garment is called. Here's what Wikipedia says about the word EMIR: Emir (Arabic: أمير; amīrah, ãmir, "commander" or "general", later also "prince" ; also transliterated as amir, aamir or ameer) is a high title of nobility or office, used in Arabic nations of the Middle East and North Africa, and historically, in some Turkic states. While emir is the predominant spelling in English and many other languages, amir, closer to the original Arabic, is more common for its numerous compounds (e. g., admiral) and in individual names. Spelling thus differs depending on the sources consulted. 24. What do you think of Hanna's reasoning? 8. What did you think of Lola's adventures? Did it make sense to you when the young man told Lola, "The only true home for Jews is Eretz Israel" (p. 50)? Yes, the spiritual homeland of the Jews is and always will be Eretz Isreal, but this should not mean that all Jews should actually live in Isreal and take it away from the Arabs. It is the homeland of the Palesinians also. 9. What did you think about Stela and Serif Kamal, the Albanian Muslims Lola met? Stela and Serif are traditional Muslims who are kind and concerned about others. Stela shows her kindness by inviting Lola in for coffee and engaging in conversation with her, the laundress. Serif is an intellectual with so many books in his personal library. It is interesting to find out that he is the chief librarian and speaks 10 languages. His marriage to young Stela was arranged and is a happy one. 10. Why do you think the Nazis were intent on destroying Jewish books? Could something like that happen today? Before you answer, take a look at Banned Books blog. Yes, things like this are happening today. The Nazis wanted to 'plunder the cultural heritage of the Jews' to protect Aryan blood and wipe the Jews out. 11. What do you think of Herr Doktor Doktor Werner Maria Heinich, Hanna's colleague and teacher? knew more than anyone about the original crafts and materials of ancient manuscripts. taught by 'hands on' methods, expecting his students to master ancient crafts related to book making. avoided the square where Hitler announced the incorporation fo Austria into the Third Reich. 12. What do you think of Frau Zweig, chief archivist at Historisches Museum der Stadt Wien? Frau Zweig was very modern in her thinking and dressing and was dissatisfied with the old school way of doing things. She was impatient with the status quo. 13. What do you think of the assertion that "a charge of collaboration was a useful way for the Communists to get rid of anyone who was too intellectual, too religious, too outspoken" (p. 100)? I too am having a hard time discussing the book....I am having to reread the chapters in order to find answers and discussion. I really loved the book as I was reading it and read right through. Maybe it is because of the chapters being like short stories. We don't see enough of the characters to make them stick in our brains for discussion?? Also my grandchildren have been here for spring break, so concentration is difficult with them around. Also I have been having a heart flutter and have been to the cardiologist and had some tests done this week - must be the medications, so we are changing dosages and seeing how that helps. Also I have overcommitted myself to book discussions and am not keeping up any where. Those are all the excuses that I can think of right now other than 'the dog ate my book'. Anyway I am ashamed of myself for not posting my thoughts because I am so happy that I read this wonderful book. I may have to find another way of reflecting on the chapters other than answering the questions. I hope that today I will find enough 'book' time to do some writing about my thoughts. Although I have surprisingly read the pages involved with the questions Bonnie posted, I am both embarassed that I am unable to remember some of the names of the people referred to in the questions and just couldn't get into the questions even though I have been enjoying the book. I have found the joy the main characters have in their work to be impressive. However, Hanna's mother has taken her professional zeal to the extreme. I wish I had found a career that gave me greater satisfaction (being an auditor/accountant for the state doesn't provide much job satisfaction other than the resulting income). Fortunately, I have other outlets that I do find satisfying. 14. Herr Doktor Franz Hirschfeldt (Jewish) and his half brother Kapitan David Hirschfeldt (Christian, but with a Jewish name) are an interesting pair. Even though the Waidhofen manifesto was supposed to stop duels with Jews (p. 114), David comes to his brother to be stitched up because "it seems my Bavarian Mutti no longer provides enough pure blood to counteraact the taint of our father" (p. 115). What do you make of this strange situation? 15. Franz Hirschfeldt chooses not to visit his mistress on his way home, then becomes furious when he realizes his wife has been with a lover (pp. 117-120). What a double standard! Then, when his mistress Rosalind decides to go out for the evening after their "untender coupling" (p. 120): "He was chagrined. It was he who should decide when to end the affair, not she" (p. 121). What do you think of his thinking? 16. Herr Florien Mittl (Christian bookbinder, Franz's patient) noticed a "beam of sunlight lay like a stripe of yellow ribbon across the workbench. It hit the sad, tattered, untouched cover of the book. And then it flared on the freshly polished silver of the clasps" (p. 124). Do you think he sold the silver to pay for a "cure" for the disease that's stealing his memory? 17. The silver clasps are destined to become earrings for the doctor's mistress and another pair for his wife, his "fallen Angel" (p. 127). What do you think about that? 18. Dana Faber (p. 135) is a hospital in Boston, an interesting thought in that Faber is the name of the German general who tried to get his hands on the haggadah. Do you think the author did that on purpose? 19. Hanna's mum paced as she made her presentation to the medical society, and she had her audience transfixed. "She loved the strut and swagger of being a top surgeon, a top woman surgeon" (p. 136). Does she deserve credit for having reached a position that was difficult for a woman to attain? 20. Hanna was impressed by the ethnicity of her postdoc friend Raz, "one of those vanguard human beings of indeterminate ethnicity" (p. 141): part African American, part native Hawaiian, part Japanese, part Swedish. Raz's wife was a mixture of Iranian-Kurdish-Pakistani-American. Hanna thought, "I couldn't wait to see their kids: they'd be walking Benetton ads" (p. 141). Do you think this is where we humans are headed? 21. Judah Aryeh (a rabbi in the Geto) said to Giovanni Domenico Vistorini (Catholic inquisitor): "Your church did not want your holy scriptures in the hands of ordinary people. We felt differently. To us, printing was an avodat ha kodesh, a holy work" (p. 156). What do you think about burning (or banning or challenging) books? 22. 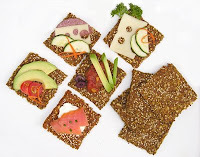 What did you think about the reason Vistorini sometimes allowed Jews to keep some of their books (p. 157) and especially his reason for finally signed and saving the Savajevo Haggadah (p. 189)? 23. Why would a Venetian Christian like Dona Reyna de Serena have a Jewish prayer book? 6. Hanna believes that "if something can be known, I can't stand not knowing it" (p. 41). Can you understand that feeling? What were you thinking when Hanna implored Ozren to get a second opinion on Alia's condition and he becomes angry, saying, "Not every story has a happy ending" (p. 37)? Hanna's attitude of wanting to know things that are known is admirable. She is quite the knowledge seeker. I enjoy learning, but am probably less enthusiastic about my quest for knowledge. I think Ozren is aware that Alia's condition is not treatable yet prefers to behave towards his beloved son as if there is hope. 7. "Bits of butterfly don't generally wind up in books. Moths do, because they come indoors, where books are kept. But butterflies are outdoor creatures" (p. 43). So how did bits of butterfly wing end up in the book? Aha! I have now read far enough in the book to resolve this mystery. Generally, I prefer linear books, but I like the way Brooks identifies changes in time/location with her chapter headings. Lola lived quite a life! Given the changes in the acceptance of Jews I thought that the statement was a good forewarning of things to come. It was encouraging indeed to know that not everyone shared the hatred of Jews that was prevalent then and now. 10. Why do you think the Nazis were intent on destroying Jewish books? Could something like that happen today? Before you answer, take a look at my Banned Books blog. With the advent of Internet and greater acceptance of diversity, I think that it is less likely that widescale book burnings would occur. I briefly scanned the blog on banned books so may have missed the section definining banned books. From my understanding of banned books, this is not nearly as destructive to culture as burned books. In some of the cases, the banning seems to be a matter of how limited funds and time are spent. It becomes a question of who gets to make the decisions on which books are available in libraries and schools. Mum's talk was humbly titled "How I Do It: Giant Aneurysms." It's not a important question ..... but I was wondering! LOL!! Maybe a better question is how do you find the Australian colloquialisms within the book? The author has definitely got them right...which she should given that she is Australian herself, although she has lived away from here for a very long time. Allison, you saw this reading schedule here. It should be in the sidebar, but for some reason Blogger is not letting me update it there. I've tried for over a week. If you click on the links, you'll get to the questions for that section. Clicking on the label POB-DQ gets all the questions about this book, which is why the POB-DQ label should be used only when ASKING questions, not for answering them. We should be discussing pages 91-189 this weekend, but I don't have the questions posted yet. Thanks to Mary Zorro, Marg, Shirley, and Allison for keeping the ball in the air. UPDATE: I tried something different -- hitting the ENTER key to "add item" instead of clicking on "add item" as directed -- and it worked! So we now have this schedule at the top of the sidebar. I don't understand why things always work, until suddenly they don't. Anyway, now I'll concentrate on coming up with the next set of questions. If you can think of a question or two, please post them with POB-DQ as a label. Thanks. 1. We've met two main characters: Dr. Hanna Heath and Dr. Ozren Karaman (Muslim). What do you think of Hanna? What do you think of Dr. Ozren Karaman, "a thin young man in faded blue jeans" (p. 13)? I like both characters, and I think Brooks did a nice job giving us a good sense of who they are in not too many pages, both from their interaction with each other as well as the description of their relationships with others, Hanna's mother and Ozren's son, specifically. 2. When I reached the words: "And then he handed me the book" (p. 13), I wrote this note: "Oooh, I wonder what that must have felt like, to know you are holding such a treasure!" If you click on Mary Zorro's link, you have the closest we can get here at Book Buddies to having the book in our hands: looking at it page by page. What do you think of those illustrations? My initial response upon seeing the illustrations was a feeling of connection through time to those who created them and all those who have also seen them. 3. Hanna believes, "Change. That's the enemy. Books do best when temperature, humidity, the whole environment, stay the same" (p. 13). See what change has done to the actual Haggadah by looking at the UN photo Mary Zorro found. Have you ever been dismayed at what's happened to an old book you have seen? Tell us about it. I have a few books that belonged to my mother when she was a child. Obviously those books are nowhere near as old as the Sarajevo Haggadah, but they are not in good shape, although I still treasure them. 4. I love my books for what they SAY, not for their physical properties. Book collectors value a book for itself, the THING, not the words inside. I can see value in both views. Tell us what you value about books. I think that I first and foremost value books for what they say, and yet I'm reluctant to abandon "real" books for the new electronic versions because I love how a book "feels" and "looks" - so I guess there is something about the physical aspects that appeal to me too. 5. "Kunta Kinte" (p. 28) ... do you remember (or know about) Alex Haley's 1976 book Roots, which became a 12-hour TV mini-series in 1977? Could we say this novel is about the "roots" of a book? I was still a child when Roots was on TV and wasn't very interested in watching it. I haven't read the book either. But I certainly am aware of the feelings that Roots generated among many people about genealogical research and finding out who we are from we came from. I like the idea of this novel as being about the "roots" of a book. I can relate to both feelings - wanting to know and believing that we have to let go and walk into the darkness. The trick, I think, is realizing which is appropriate in a given circumstance. I loved the character of Lola and this part of the story, so heart-breaking and yet so filled with hope. I believe in the concept of a "gathering of Israel" so the idea of Eretz Israel being "the only true home for Jews" fits with my worldview. The goodness of people is a touching thing. From the first time that Lola met Stela to the later period when they cared for her, I was moved by the nurture by the Kamals for this girl so different from them, so "other." 10. Why do you think the Nazis were intent on destroying Jewish books? Could something like that happen today? The hatred that the Nazis had for the Jews was so pervasive that they wanted to wipe out the fact of their entire existence. It's so hard for me to understand the depth of that hatred. It's also hard for me to understand the depth of the hatred that some people have even today about certain books, about particular concepts or ideas. I think ultimately both must be based on fear. I'm on page 145 of the book now. I can no longer find the reading schedule that I thought I saw here previously, but I'm ready for further discussion! The whole Palestine/Israel question is quite a complex one really, and one that we are pretty much still dealing with today. Does it make sense that people that have lived for hundreds of years would think that it made sense to just up and leave to live in a newly created country where they weren't really wanted? No. But then when you add in the Nazi threat and the latest wave of anti-Semitism, then you can understand that there were many families who would just want the chance to live in safety. Mordecai was however a radical, and yet he and the people who went with him turned out to have made the correct decisions. It did seem strange to me that Marshall Tito would disband the partisan groups but I think I had heard of that happening before, not sure whether it was in regard to Tito or not. Even stranger that the commander expected the group to just disband and go home, when for so many of them there was no home to go to. I was shocked by Isak's actions, but understood his desperation. There are good people everywhere. I definitely think it could happen again, and quite frankly how do we know that it isn't happening in places where there are ethnic tensions. I found the idea that they wanted to create a "Museum of the Lost Race, to exhibit the finest Jewish objects, after the people themselves are gone" (page 86) laughable. I think that Serif and his boss were right to be sceptical, and right to hide the Haggadah. Good job they were on the same wavelength though given how quickly they had to think when General Faber came to visit and demanded to be given the Haggadah. I thought that some people might be interested to see some of the different covers there are for this book, simply because I know that my cover is different to one that other Book Buddies are reading. Yay! The book finally came in at the library - seemed like I was number 1 on the list forever! I really liked Hanna straight off! I like her humour (for example when she talked about the backpacker on the plane) and the whole phone calls at 2am thing as well. I have to say that, in a way, I find her kind of disconnected from the world. She is passionate about her work, and has some connections to people who are all a long way from her every day world but still accessible, but she doesn't seem to have any really strong personal connections in her every day life. I was surprised by how quickly Hanna and Ozren fell into bed with each other. To me it felt more in character for Hanna - she says in the book that as soon as feelings get involved she runs a mile. It felt less in character for Ozren, but then at the point where this happens, I don't think we know much at all about Ozren other than that he's a librarian who risked his life to save the Haggadah, and that he's younger than Hanna expected him to be. I was so glad to have seen those illustrations. They are beautiful. Thanks Mary Zorro! I don't think that at this stage of the book there were a lot of really clear descriptions of what exactly we were looking at (other than the one that has the mystery African woman in it). I was thinking that they are probably still to come. Not too long ago I went to an exhibition that was on at the State Library of Victoria where they are featuring many old books and looking at the progression of books through the ages. What I found amazing was how well preserved those books are. I know the question is have you ever been dismayed at what's happened to an old book, but as I think about the way I treat my books now - I read them and love them, I might reread them. I might just stand at the shelves and touch the spines. I reorganise them. Sometimes, if I can bear the wrench, I might take some out and dispose of them. In short, I USE them. How do I know that one of those books might not be something that someone a hundred years in the future might value and look at and think that they wished that the book had better care taken of it. In a way I guess it is different for the Haggadah, given that books were so rare when it was created and then it was passed through the years. I guess my point is that in as much as the rebinding did damage the book, the people who did the rebinding would have been doing the best they knew how to try and preserve the contents. "To restore a book to the way it was when it was made is to lack respect for its history. I think you have to accept a book as you receive it from past generations, and to a certain extent damage and wear reflect that history. The way I see it, my job is to make it stable enough to allow safe handling and study, repairing only where absolutely necessary. This here," I said, pointing to a page where a russett stain bloomed over the fiery Hebrew calligraphy, "I can take a microscopic sample of those fibers, and we can analyze them, and maybe learn what made that stain -- wine would be my first guess. But a full analysis might provide clues as to where the book was at the time it happened" (p. 17). I too am more interested in the content of a book, but having said that there are some books that I own that I love just because they look beautiful. When you compare different covers around the world for the same book, I would definitely prefer to buy the one with the most attractive cover. Yes, I will read the book and hopefully enjoy the contents, but at the end of the day, in a case like that it is the attractiveness of the book itself that I am buying. Of course, if I really want a specific book I will get it regardless of the cover. I vaguely remember the mini-series Roots but I was pretty young when it came out. I did immediately recognise the reference though, mainly because I think I remembered it from a documentary once where some African-Americans returned to Africa. In some cases they were deeply affected by what they found there. Is this book about the "roots" of a book? Maybe. I dare say it is. I guess what I am interested to find out is the story of the lives that were touched by the book. I do understand what Hanna believes, but don't think that I feel it quite so strongly as she does. For example, if I read a book about a subject that I suddenly find fascinating, then I will go off and read other books about that subject, but I generally stick to fiction. I don't really go as far as researching as such. One thing I do love to do when I read about a place I find fascinating is go off on a virtual tourist jag and visit websites, google images, just generally immerse myself in the feel of a place! I LOVE it when a book makes me want to visit somewhere. In terms of this book, I have to say that my interest is a little piqued to go off and see what Sarajevo looks like today - but I will save that for the end of the book! I wonder if Hanna's idea to get a second opinion on Alia's condition is some how a gift to Ozren. She knows that she is already pulling away from him emotionally, and this is one way she can make a difference to him. Someone took it on a picnic? Someone used the book to hold the body of a butterfly (a bit like pressing flowers) and a bit of the wing was left behind. No idea. ETA: Sorry this was stuck up the top for so long. I posted using Australian time, instead of blog time! Hanna is a meticulous professional. She is very devoted to her work. Her relationship with her mother is so difficult, and they both seem to be responsible for the anger between them. In other areas of her personal life she has problems with other relationships. She discards lovers without making committment. She jumps in bed with Ozren on the day of their first meeting. Ozren is suffering from loss in the war - his wife and now he is loosing his son. I admire his saving the book. 2. 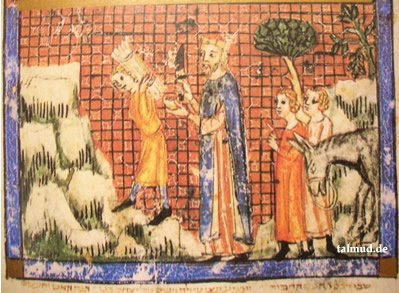 What do you think of those illustrations from the original Haggadah? Oh my, aren't they beautiful! I think that these hand illustrated illuminations are remarkable. With the Jewish laws about creating graven images, I don't know how they were permitted?? 3. Hanna believes, "Change. That's the enemy. Books do best when temperature, humidity, the whole environment, stay the same" (p. 13). See what change has done to the actual Haggadah by looking at the UN photo . Have you ever been dismayed at what's happened to an old book you have seen? Tell us about it. Yes, I have an 1866 Algebra textbook, an 1912 Life of Jesus, and a 1946 Children of Dickens, plus my mother's 1920 college yearbook. The Life of Jesus is loosing the binding and the binding is gone from the Children of Dickens. The pages are starting to loosen. I guess they were read by my mother and aunt so much that they are falling apart. 4. I love my books for what they SAY, not for their physical properties. Book collectors value a book for itself, the THING, not the words inside. I can see value in both views. Tell us what you value about books. Hanna says: "To restore a book to the way it was when it was made is to lack respect for its history. I think you have to accept a book as you receive it from past generations, and to a certain extent damage and wear reflect that history. The way I see it, my job is to make it stable enough to allow safe handling and study, repairing only where absolutely necessary. This here," I said, pointing to a page where a russett stain bloomed over the fiery Hebrew calligraphy, "I can take a microscopic sample of those fibers, and we can analyze them, and maybe learn what made that stain -- wine would be my first guess. But a full analysis might provide clues as to where the book was at the time it happened" (p. 17). I do value my books for their content, but I don't have a hand written, hand illuminated Haggadah! The value of 'The Book' in this case come from its age and methods of preparation, and the history of how the book has been saved all these years. I do remember Kunta Kinte and Roots. All of America seemed to be watching this historical mini-series together. Yes, this novel traces the difficulties that 'The Book' went through from its beginning. I agree with Hanna to some extent but I do think she was out of line when she took the information about Alia's condition for a second opinion. She had no right to take over this sensitive issue from Ozren. The parent's wishes should always be respected. V ~ (pp. 41-44)7. "Bits of butterfly don't generally wind up in books. Moths do, because they come indoors, where books are kept. But butterflies are outdoor creatures" (p. 43). So how did bits of butterfly wing end up in the book? We will journey back through time to see when and where 'The Book' picked up the butterfly wing. I like both Hanna and Ozren. They are both quite bright and appreciative of the value of books. The strained relationship of Hanna and her mother seems to have made her unable to form a close relationship. However, it did sound encouraging that she did obtain the medical tests of his son for her mother's review. The illustrations are stunning and I appreciate Zorro posting the link. I bought a large used book once that fell apart when I was reading it. I can't remember the title, but went between sadness at the book's destruction to going ahead and appreciating that at least the book was easier to transport in sections to read. Personally, I have valued books for what they say, but am finding the book's premise of repairing this book fascinating. I like Hanna's approach of repairing the book to allow safe handling and study much better than the restoration without appreciating the book's history. This discussion reminded me of a somewhat similar to discussion of quilt restoration and the practice of recycling worn out quilts to other products. I remember watching the TV mini-series about the book "Roots". I also remember the controversy about whether or not Haley stole the ideas for part of his book, but can't remember the resolution. Hopefully, "People of the Book" won't be involved in a similar controversy. It was supposed to be spring; down in the small garden by the bank's entrance, the crocuses were blooming. But it had snowed earlier that morning, and the bowl of each small flower brimmed with a foam of snowflakes, like tiny cups of cappuccino. I don't know why I love this so much, but with these words I can see those crocuses, feel the spring air, and imagine exactly what Hanna sees and feels as she presses her hand to the cold glass and looks down from the window. Alright, back to my reading. I hope the Buddies are enjoying this as much as I am. 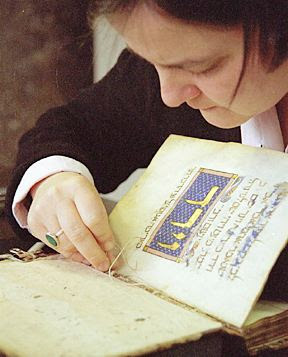 A GERMAN book conservationist, Andrea Pataki, restores the world-famous Sarajevo Haggadah, a traditional book of prayers, poems and stories about the Jewish exodus from Egypt. I was on my way to B&N back in January and was listening to NPR - Diane Rehm Show. Her guest was Geraldine Brooks discussing POB. I was so intrigued by the discussion, so when I found the book with the beautiful butterfly on the cover, I used my Christmas gift card to purchase it. I am so glad I did! Thanks to Anne, I found Book Buddies, joined and started reading the book last week. I had not intended to read it so fast, but I am finishing up today. I am very impressed with G. Brooks. This is my third GB book, having just finished March and read Year of Wonders a couple of years ago. She writes well-researched historical fiction. The book holds several surprises! I am looking forward to discussing it with you all.